Bet you all thought I stopped bloggin' again eh? Stuff has been busy lately. I spent last weekend in Amarillo looking for a new home. Working those details out now, should be moving in the next month or two. Part of this means a cut back in the card budget... booooo!!!! But hopefully once we get up there and start settling in, the budget will get upped again. On to a more pleasant topic... mail!!!!! A couple of redemptions, a prize winning and a cheap eBay pick up! Here is a die-cut Kemp I won in a twitter contest! 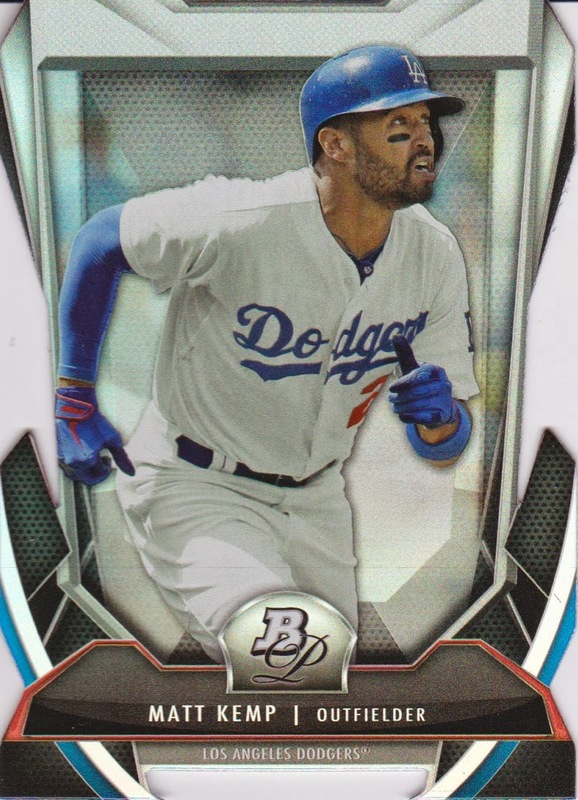 I'm pretty sure most of my Dodgers guys already have this, but if not it's definitely available! UAJR-JM2 - Missing /99 ---- Seriously, the highest printrun, I can't find it anywhere!!!! Here's the first of two redemptions! 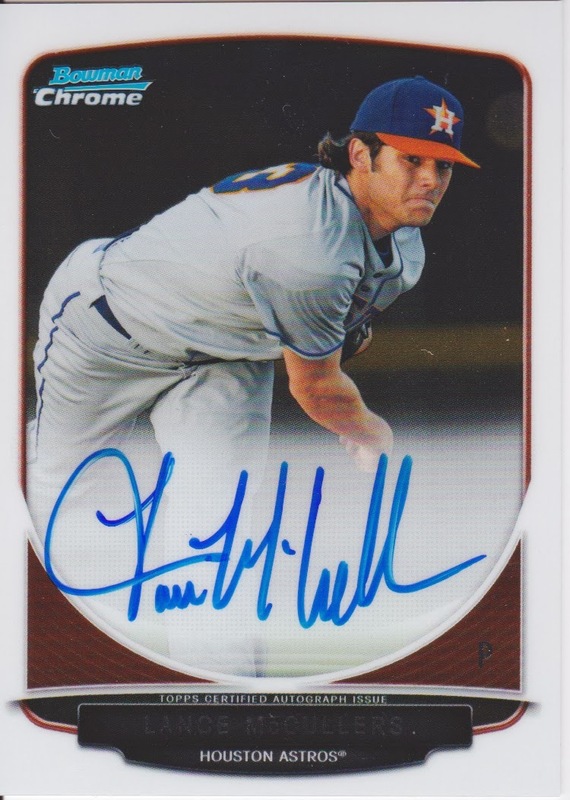 Lance McCullers is a hot prospect that should shoot up through the minors. He had a great year last year and I hope he can get to AA or maybe even AAA this year. Great autograph too! 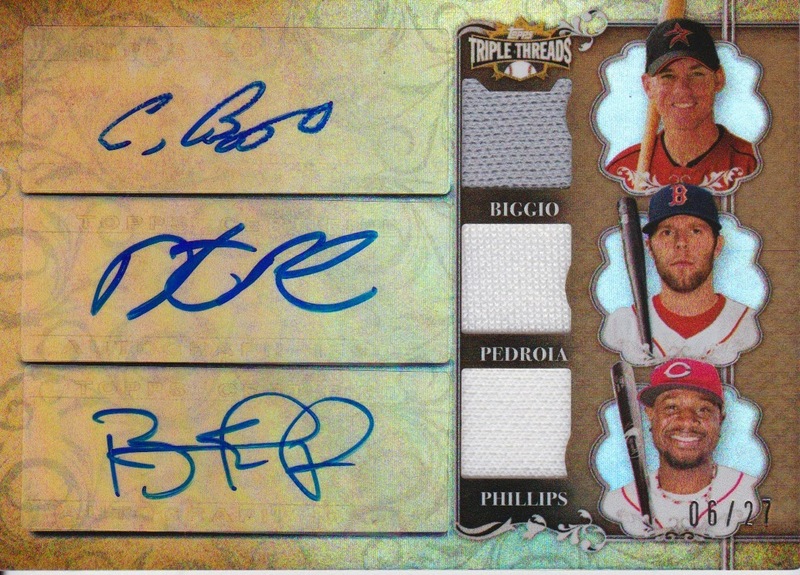 Finally, a holy grail type redemption card for me... a sweeeeeeeeet Triple Auto Triple Relic numbered /27! Sorry it's been so long everyone! Thanks for stopping by! 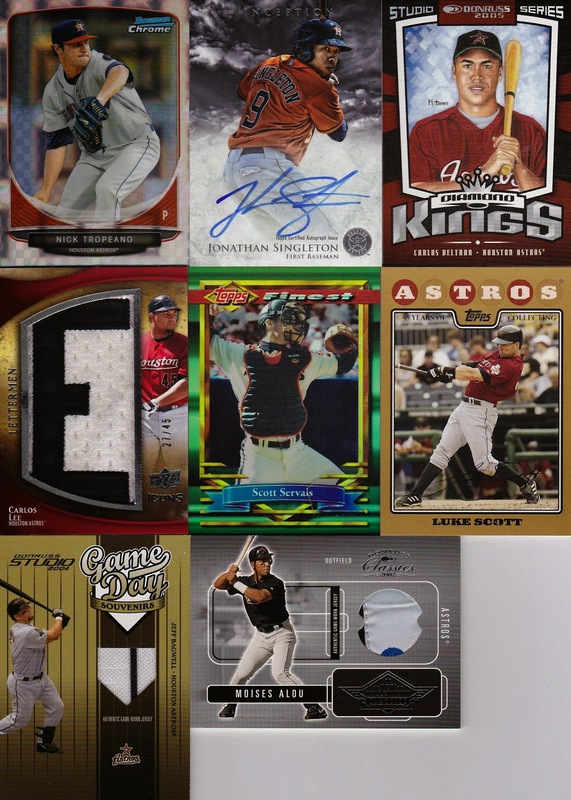 Here are some recent pick ups... random cards from trades, purchases, trade night at the LCS and eBay... 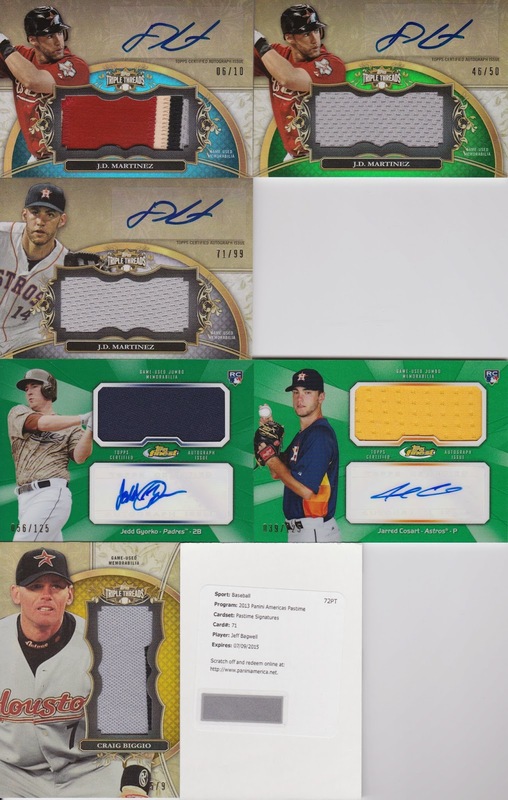 I realized after I packed up all the cards that I scanned the wrong JD Martinez auto relic /50, they were sitting together on the desk and I should have scanned the one with him in the red Astros jersey batting rather than the white fielding... oh well, you get the point! How about that Biggio!!! 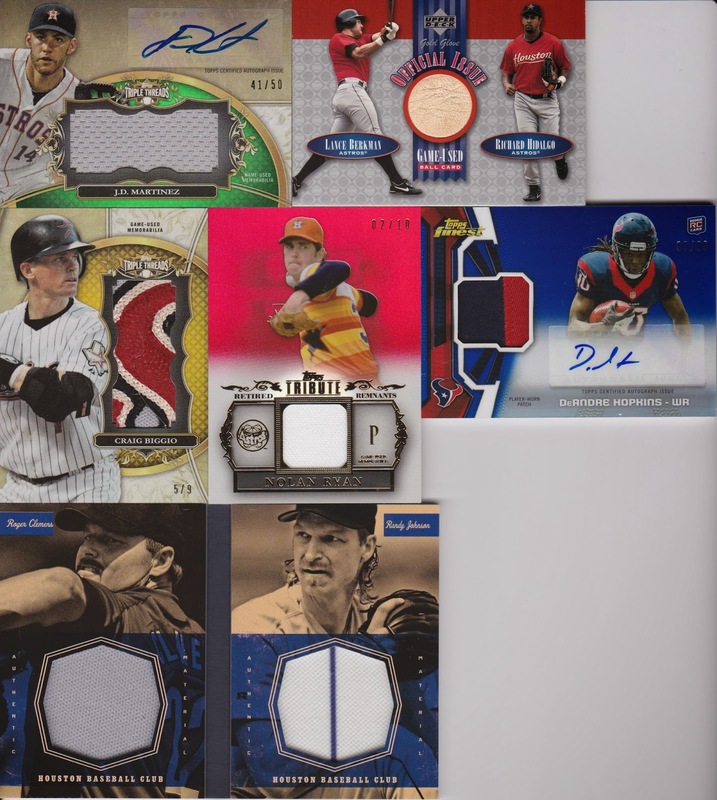 From the "s" on the jersey and numbered /9! Got that from my LCS, who used my store credit from trade bait sales... The Nolan!!! 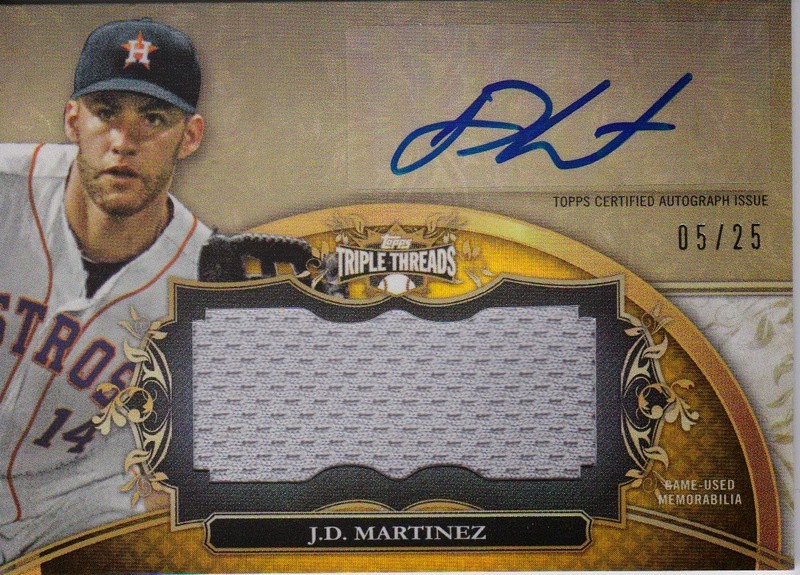 How about /10 from Tribute?!?!?! Sweeet looking card! That's a book on the bottom with Roger and Randy. Panini listed them both as "Houston Baseball Club" players but then used an Arizona swatch for Randy. Nice idea though Panini. It's a sweet looking book, just got to find a way to store it now! Anyways, thanks for stoping by everyone! 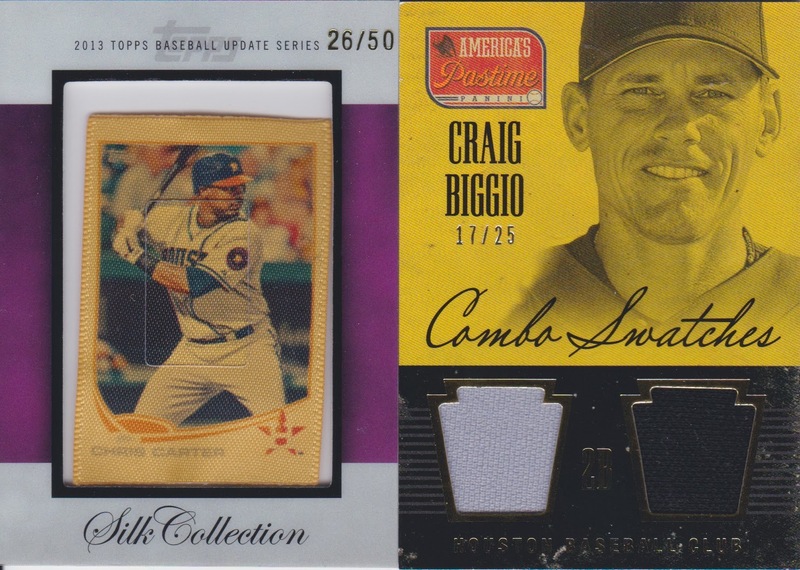 Finally, another silk to add to the collection, and a parallel of Biggio from America's Pastime numbered to just /25!!!! Man, I love those Astronauts inserts! 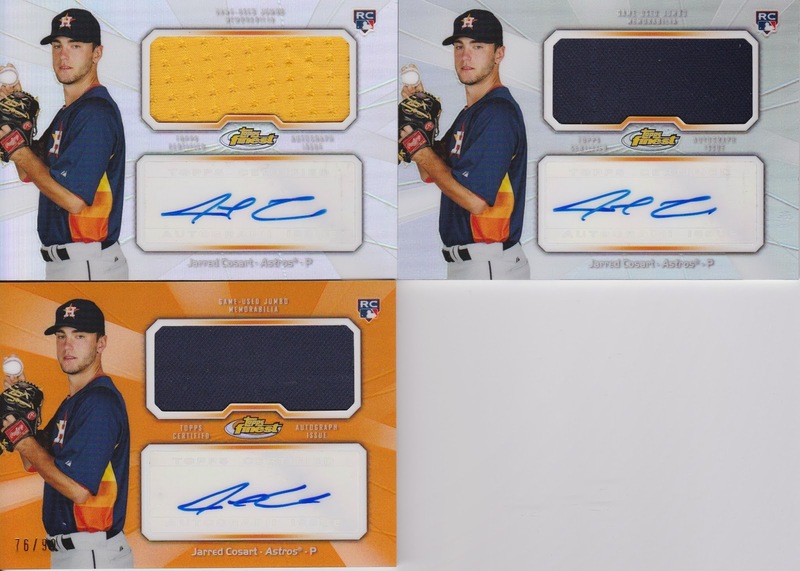 Great design, patch logo in the background, just a sweet insert set. Also really like the Tuskeegee Airmen cards, what a great way to honor some really brave men. 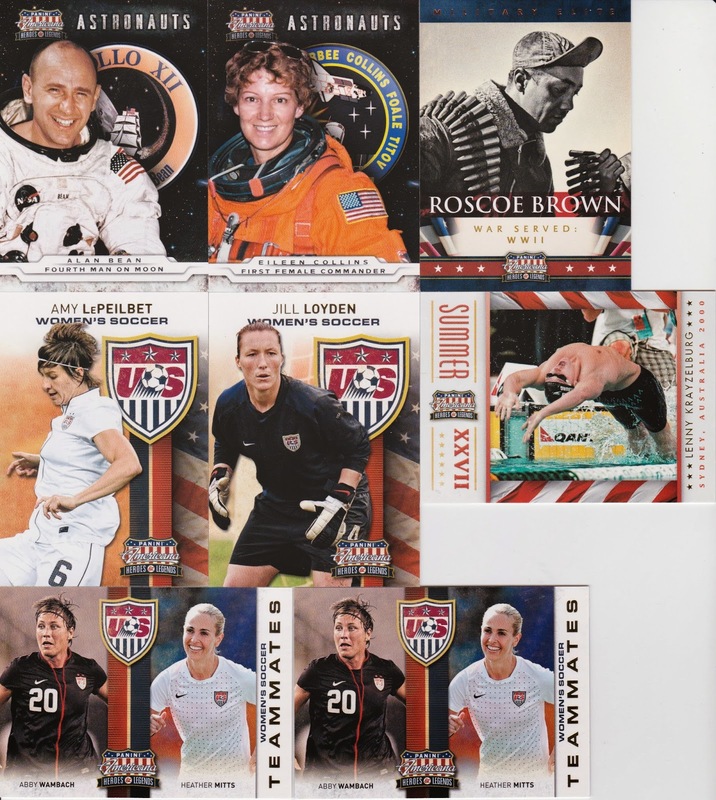 I'm not a huge fan of the way they tried to shoehorn the women's soccer subsets into this set, think they deserve their own set rather than be relegated to inserts. Really feels forced. I do like the Olympics subset though. Brings back memories of watching the games. Scott Hamilton relic, not too shabby, and they found a picture from when he actually had some hair! Haha! As far as Vance Brand goes, I can't say that I remember the name, but a quick read of the back of the card tells me that his first flight was the Apollo-Soyuz Test Project in 1973, the man had a key role in the eventual peace between the US and USSR. 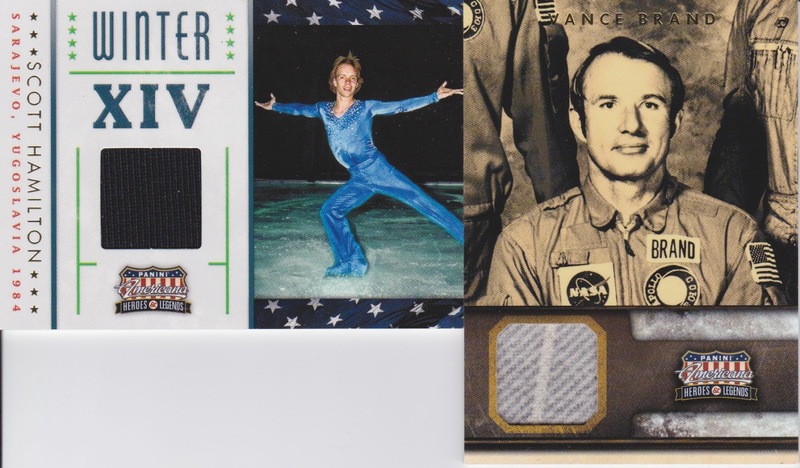 If anyone has any of these Astronauts relics or inserts laying around, let me know! Or any Space/NASA related cardboard you're looking to move!